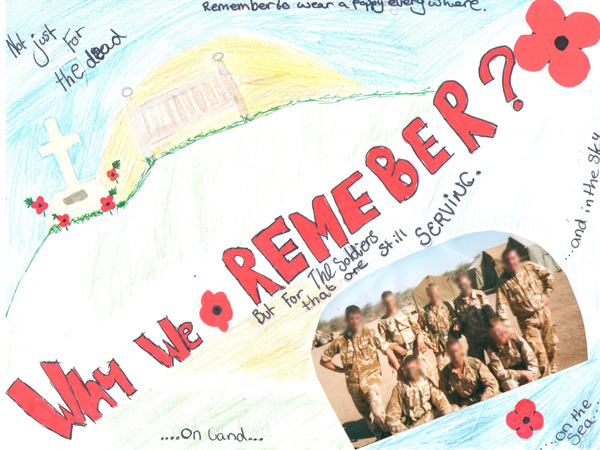 In 2013, Poppyscotland invited schools from across Scotland to create a poster which represented their ideas on the theme “Why do we remember?” The response from schools was overwhelming and 9 posters were shortlisted by the judging panel to progress to the final stage of the competition and put to a public vote. After a few weeks of intensive voting, the final stage of the 2013 Poppy Poster Competition has concluded. The votes have been counted and verified and we are very pleased to announce the winner of the competition. St John’s Primary, Port Glasgow. Congratulations to Chloe and very well done to all the runners up. This year’s competition has been a great success and we would like to thank everybody that took part. In September 2014 we will be announcing our brand new competition so keep an eye out for the new education pack being delivered to every school in Scotland after the summer holidays to find out more! Remember to click on the links below to share this with friends on your social network page and keep up to date with the latest developments for next year’s competition.